Now that we’re excising Australia from the Australian Migration Zone (because we’re snivelling racists) detention centres could be anywhere. A reader who wishes to remain anonymous wonders if that’s what’s going on down Petrie Plaza in Civic. Got an image of Canberra you want to share with the world? Email it in to images@the-riotact.com . It’s interesting how reducing the migration zone was ‘shameful’ and ‘xenophobic’ when the coalition did it, but it’s ok when Labor does it. Whoever said it was ok? It is idiotic, knee-jerk, and compassionless policies like these that make me think Australia will get what it deserves on 14th September. On 99% of issues I cannot tell the difference between Labor and the Liberal/National cartel in Commonwealth politics. It would be more ethical to excise the racists from Australia and send them all back to where they or there ancestors came from. And that’s why we need even more “traffic calming” measures to get rid of all those nasty horseless carriages from Civic, because pedestrian plazas are so warm, and inviting and people friendly – and look at all those lovely cyclists spreading bonhomie hither and yon as they glide past, waving to the refugees (and the lurking kangaroos) and singing polly wolly doodle all the day! 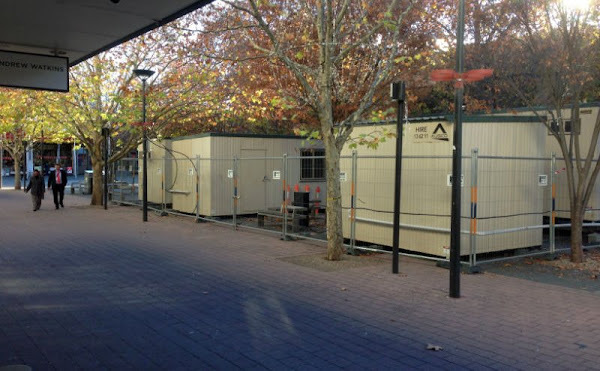 It is a big surprise to me just how much work is being done in Canberra’s public places during our centenary year. On Canberra day I noticed a large area fenced off around the high court, the lake is about 2 foot lower to fix the bridge, then this. The lake is lower to fix the dam, actually. I don’t know about the other things, but in this case serious problems were unexpectedly discovered with the dam that required them to start fixing it as soon as possible (it blew the NCA’s budget). At least Ozymandias Enterprises get the job done, plaque and all. I thought all the works in 2012 were to get us ready for 2013. But it turns out we’re just not very organised.